The Democratic primary of 2008, much like that of 2016, featured a sharp debate on global trade — about who writes the rules, who benefits, and who, ultimately, is harmed. And like 2016, the 2008 discussion was largely dominated by so-called trade agreements, namely the North American Free Trade Agreement. Signed into law by Bill Clinton in 1993, NAFTA encompassed the economies of Mexico, Canada, and the United States, and its implementation was accompanied by the usual lofty promises. Whether these promises were fulfilled is another question entirely. Barack Obama, during his run for the presidency, made his view quite clear. Many have since expressed a similar take. In a debate featured in the New York Times in 2013, economist Dean Baker argued that, in one sense, NAFTA did what it was supposed to do: It placed downward pressure on wages. The agreement, which “heavily subsidized U.S. corn and other staples poured into Mexico,” also forced millions from their farms, devastating families and sparking a rise in poverty. But everything will work out this time around. At least, that is the argument President Obama is making as he prepares for a final push to pressure lawmakers into backing the Trans-Pacific Partnership, an agreement that has been deemed “NAFTA on steroids” by critics who believe it will further erode labor conditions, harm the environment, and grant corporations unprecedented power. Not surprisingly, the negotiations that preceded the agreement, which encompasses 40 percent of global GDP, were shrouded in secrecy — unless, of course, you are a representative of Walmart, Nike, General Electric, or Dow Chemical. Thanks to the work of organized labor, environmental groups, consumer advocates, and many lawmakers, however, the president is confronting strong and vehement resistance. Both Donald Trump and Hillary Clinton have, in word, stated their opposition to the deal, and its controversial provisions have become major points of contention throughout the presidential race; the Democratic convention in July featured copious anti-TPP protest signs, many of which were brandished during the president’s much-lauded speech. But Obama has remained resolute and, at times, he has been outright dismissive of his critics. The president’s argument is, however, a fraudulent one, a fact recognized by mainstream liberal critics of the deal, from Joseph Stiglitz to Paul Krugman, among others. It is unsurprising, then, given this context, that President Obama’s most reliable allies in his aggressive push for the TPP have been the business lobby and corporate Republicans, whose desire to please their benefactors exceeds even their reactionary opposition to the president’s agenda. “We need a trade deal that opens markets for us,” Tom Donohue, the group’s president said in July. And as the New York Times reported earlier this week, business representatives have been hitting the road hard of late, touting the agreement’s prospects and calling on lawmakers to fight for its passage. And while Republicans and their patrons argue that the agreement is not brazen enough in its support for the right of corporations to impose their will without restrictions, Democrats are calling for a nicer agreement, one that provides at least some protections for workers and the environment. But they, too, are part of the problem. The president and many congressional Democrats have, in effect, accepted the premise that big business should be permitted to dictate the rules by which global markets function, just as long as these rules allow for some cushioning for the masses. But given the balance of power within the so-called “trade advisory system,” massive corporations are certain to exert the most influence, silencing the meager representation granted to labor and those who represent the interests of consumers. According to data compiled by the Washington Post, “Industry voices dominate the trade advisory system,” making up 85 percent of official trade advisers; by contrast, only around 5 percent represent labor. Many have expressed genuine surprise that President Obama, ostensibly a progressive, would push so ardently for a deal shaped by and for the needs of capital. Such surprise is confusing, given the president’s insistence, all along, that he is a “New Democrat” — that he emerges from a tradition, now dominant within the Democratic Party, that long ago abandoned the left-labor alliance that bolstered the party through the New Deal period. And despite her rhetoric, Hillary Clinton is no diversion from this tradition, and she, like Obama, has done much to shatter vague hopes that she will reverse her rightward pivot — from her choice of a running mate who has in the past been hostile to labor to her selection of Ken Salazar, who both supports the TPP and is “a reliable friend” of big oil, to head her transition team. 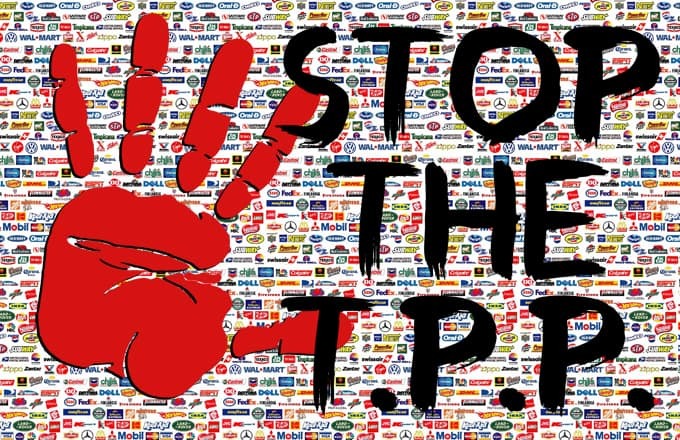 But the fight over the TPP reaches beyond the confines of American electoral politics; it is, more broadly, a conflict between the forces of global capital — in partnership with political leaders — and the working class. Our solidarity must, therefore, extend beyond the borders of the United States to thosemarching in the streets to combat the scourge of corporate “trade” pacts that empower industry and silence, often violently, the voices of the most vulnerable. And it must extend, most importantly, to those who have been victimized by the very same corporations attempting to pave the way for yet another assault on workers and the environment. This entry was posted in Current News and tagged class war, corporate power, Economic Justice, economy, TPP by TD Daniell. Bookmark the permalink.